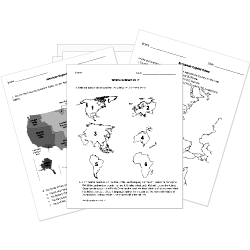 You can create printable tests and worksheets from these Local History, Geography, and Culture questions! Select one or more questions using the checkboxes above each question. Then click the add selected questions to a test button before moving to another page. When did the railway reach Limerick? What year was Limerick established? Which of the following was a coeducational state teachers' college for blacks? Who established the Piney Woods School? What is the state fruit of California? How did Cabeza de Vaca contribute to the history of Texas? He was the first person to map the Gulf of Mexico and the Texas coastline. He conquered the Aztecs and contributed to Tenochtitlan becoming Mexico City. He was the first person to report on Texas, and inspired the Spanish to continue search for gold. He discovered the New World which led to exploration by several European countries. In 1865 the federal government setup the , an organization that helped feed, clothe, and provide medical care to former slaves. Who helped establish the Missouri Compromise line? What is the nickname for Kentucky? Which river is most important to the History of Louisiana? Which Natural Disaster is most common in Louisiana? A is a segment of the worldwide system for standardizing time. Which is an example of a STATE legislative body? In which hemispheres is New Jersey located?